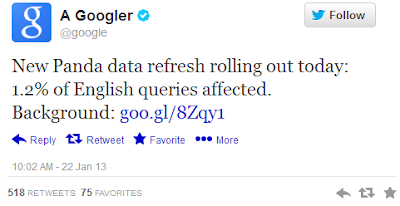 In previous post I mentioned the strong signs of a Google update, which Google denied completely. Everyone knows that in coming days Google will refresh algorithm. Two days later, Google did exactly the similar. 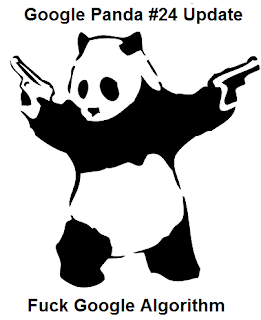 Now Google has launched another rocket for bloggers in a form of Google Panda Algorithm update. This update announced by Google on social networking website Twitter, this Algorithm update impact not more than 1.2% of English search query globally. The previous update was Google Panda#23 that was pushed out on December 21, 2012 which affected 1.3% of search queries. There are 24th revision or refresh to the Panda update since launching in February 2011.In the last post, we mentioned the significant report and chatter about the Google Panda update. On January 15, 2013 many SEOs and Webmasters proved the ups and downs in their Search Engine Ranking. People were thinking that the impact of the update was not that significant but still lots of webmaster are getting minimum audience to their website. If we see on other way, various blogger have verified that they are increasing in their traffic as well as SERP ranking. In below I shared the screenshot; if you look downward you can see the sudden growth in traffic. I am also surprised to see this but on that day there is no occasion or festival than how we have got increase in traffic.